In 2001, the late John Gawith (Gawith Hoggarth & Co.) and I collaborated to create an all new Virginia/perique flake. It was a pleasure working with John, and the result, Stonehenge Flake, was met with overwhelming enthusiasm. 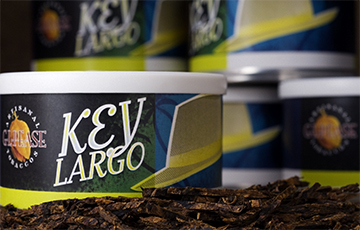 Though originally produced as a limited edition of approximately 1500 2oz tins, the continued high-regard of this tobacco, along with repeated requests to recreate it, made bringing it back as a regular blend an obvious choice. It took some doing, but thanks to the efforts of everyone involved, we were able to bring Stonehenge back to life. 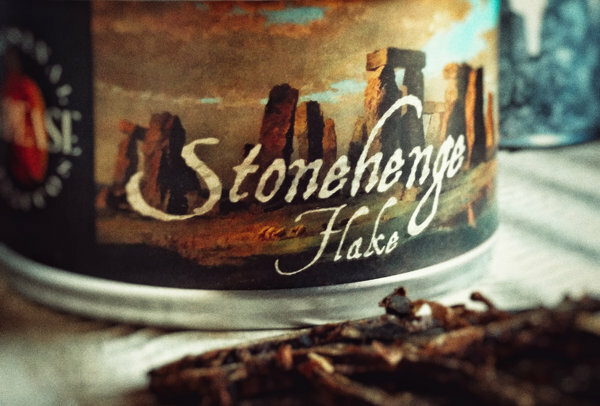 Stonehenge is a wonderful traditional flake comprised of bright flue-cured and sun-cured leaf from Brazil, Zimbabwe and Malawi, with just a touch of Burley added for a bit of body, and a slightly fuller flavor. Then, we added a good measure of perique for its unique contribution. Once blended, the leaf is steamed, hot-pressed into blocks and aged, allowing the flavors to further ferment and integrate. The mature blocks are sliced into thin flakes, and cut into 2" lengths. The label is new, but the tobacco is manufactured to the precise formula and protocol John and I developed all those years ago. Though the actual development of this new blend has took just over a year, it's fair to say that it's been over a decade in the making. I've been intrigued by the idea of aromatic blends, but never really satisfied with any I've tried, and have experimented with various concoctions along the way in the hopes of finding some magical formula. But like so many things in life, the quarry remained elusive. It was essential, as it is with all of my blends, that the tobaccos take center stage, with the aromatic top-note acting as an enhancement to the overall effect without dominating the underlying leaf. Perhaps even more challenging was that it had to taste like it smells right to the bottom of the bowl, offer a delightful room aroma, and leave the pipe clean and free from lingering "ghosts." Distinctively delicious! We season fine red and golden flue-cured Virginia tobaccos with rare condimental leaf, enhancing the result with a subtle vanilla/bourbon topping that is never overbearing. 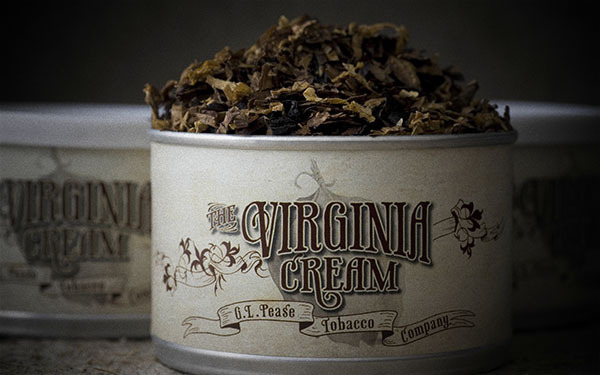 Rare for a blend of its genre, The Virginia Cream delivers on its aromatic promise from the first puff to the bottom of the bowl, while leaving the pipe clean and free of phantom flavors. An all-American blend ideal for Virginia fanciers craving something a little sweeter. In the 15th April issue of the News, I mentioned a new blend, which at the time was "code named" Maduro Cut Cake. It wasn't a very imaginative name, though it was at least somewhat descriptive. 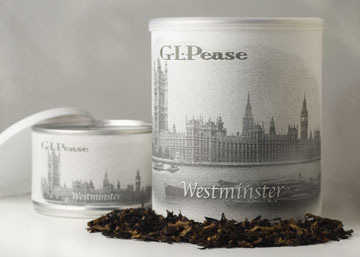 A darkish blend incorporating a little cigar leaf, pressed into cakes, and sliced. See? Not very imaginative. But, it provided me something to call it, other than, "this new prototype with cigar leaf," and as I let people at shows sample it, the response was very positive. Finally, some weeks later, a friend emailed me, writing, "Why don't you call it Key Largo?" It was perfect. A classic, in keeping with the theme established by Maltese Falcon, with a tropical feel, and there's more than a little cigar smoking depicted in the film. Names lead to concepts which lead to artwork, and once again, illustrator and designer extraordinaire Daniel Bertalotto, of DOXA, did his usual fantastic job with the label art. I think it's really stunning. But, what about the tobacco? Now that it's finally on the shelves, I guess I should say a few more words about it here, for those who don't read the News page. Key Largo is full of surprises. It's got wonderful, layered flavours of rich Virginias, oriental tobaccos, including a little Cypriot Latakia, and hints of earthy spice from the cigar leaf. It presents a creamy, delicious smoke, with a softer room aroma than might be expected from the ingredients. It's refreshing, yet full-bodied and satisfying. I've been enjoying the prototypes through three seasons, but it seems exceptionally well suited to our late summer smoking. This is a unique blend, and defies the usual classification. It's neither an "English Mixture," nor a Virginia, nor is it just another cigar-leaf blend, yet it offers something of each. Maybe someone else can find a pigeonhole for Key Largo to roost in, but I cannot. I expect this one to age beautifully over at least the next couple decades. It'll develop increased fruitiness and complexity during the first year or so, and real magic will occur after five or six. And, yes, the coffee mug is available. 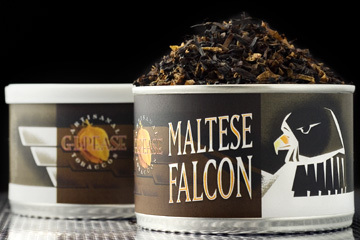 I first began writing about Maltese Falcon in early November, and now, I'm excited to the point of bursting to announce that it is finally winging its way to the tobacconists' shelves. This one sports a brand new look, thanks to the creative direction of my dear friend Neill Archer Roan, and a brilliant realization of Neill's direction by designer and illustrator Daniel Bertalotto of DOXA. The label is gorgeous, but it's what's inside that counts, right? Originally conceived as a replacement for the old Raven's Wing, Maltese Falcon quickly evolved into something bigger. It's a rich, bold blend, with excellent body, a beguiling sweetness, and solid structure, ideal for those who enjoy a sophisticated, yet comfortable and refined English-style mixture. Westminster is taking the world by storm, or at least some small part of the world. From the tin, “The very essence of the traditional English mixture; rich, elegant, refined, and exquisitely balanced. New World red virginias are enhanced with a gentle caress of bright leaf, then lavishly seasoned with rich oriental tobaccos and generous measures of noble Cyprus mountain Latakia. A satisfying blend, presenting layers of flavor to delight the senses as it develops in the bowl. The perfect every-day English.” - This one has been getting fantastic reviews in the wonderful tobaccoreviews.com webbase. Give them a read! Or, read the story about it's development, On the Road to Westminster in The Briar and Leaf Chronicles. “I have been bested by this most seductive Lady Nicotine. The others? I've loved them all, but never like this. They are like young birds, to be taught to fly, and set out into the world. They are my children, and I love them equally. “This one, though, is different. She brought more to me than I could give her in return. She teased me with her exotic ways. She promised a taste, and delivered a feast. “At night, I lie with her smoky kiss upon my lips; her perfume lingers about me, filling my head with reverie. As the sweet arms of Morpheus carry me to the abodes of slumber, I look forward to dreams of her. In the morning, I rise to thoughts of her, swirling through the fog of awakening. All through the day, she fills my thoughts. When I am with her, she consumes me. When she is absent, I long for her. Barrie can have his; this is my Lady, my Arcadia, my Queen. Nearly a year in the making, this blend, the first in the new Heirloom Series, features some truly magnificent Syrian Latakia, possibly the finest example of this exotic leaf that's been seen in 40 years. 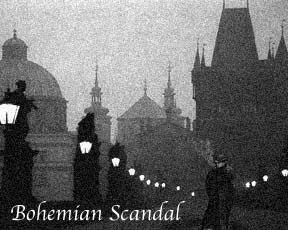 When we arranged for its import, and the first samples arrived, I fell quickly and deeply for it; Bohemian Scandal is the love child of our little tryst. The Syrian is wine-like, possessing subtlety and nuances that would be easily lost to a heavy hand at the blending table. I chose bright and red Virginias, and rare oriental tobaccos to compliment the spice of the Latakia; hints of cardamom, nutmeg, cinnamon are present, along with a gentle smokiness. A soft, slightly tangy sweetness continues throughout the bowl, with the complex, earthy notes from the oriental tobaccos providing depth. The flavor is bold enough for casual smoking, but sufficiently refined to be engaging during more contemplative moods. Wonderfully balanced, it is excellent in its youth, yet sturdy enough for long aging. Enjoy it now, and be sure to cellar plenty for future adventures. Reviews are available on the wonderful Tobacco Reviews web site. My deepest appreciation to those who have taken the time to share their impressions of my latest creation! Regretfully, Bohemian Scandal is no longer available. See the 23 September, 2004 news for more details. This collection will never be large. It's reserved for tobaccos that, I think, are exemplary in their category, or those that blaze new trails. The first was Bohemian Scandal, may it rest in peace. As most know, the vintage Syrian latakia that was featured in the mixture was lost in a warehouse fire in November 2004, shortly after its introduction. It is still presented here for posterity. The next was Westminster in 2007, a very classic mixture. Maltese Falcon was added in January 2008, then Key Largo in July of the same year. The Virgina Cream made its debut in October 2015. It's hard to make comments on a collection as full of unique personalities as this one. Scandal was wonderfully received during its short life, and has become something of a “Holy Grael” blend for many. I don't know, for sure, if this is due to its rarity, or because it really was that good. I know I liked it, but I was a little surprised by the enthusiasm of its reception. The other blends in this collection have also become very popular, and with good reason. Each has all the characteristics that can ultimately make a blend a classic. Time will tell, of course, but they've been going strong since their respective introductions, so I've got high hopes. Each one has a unique charm, yet they still seem to get along with one another. I've smoked tins of Bohemian Scandal at three years, and found it superb. I'm looking forward to the next milestone, which will be five years. I'll report back then. [At ten years, it's still going strong. The latakia has softened somewhat, but the overall experience remains delightful, with the added complexity of age bringing new elements to the smoke. -glp] Westminster, of course, is far too young to make any definitive comments on, but my experience tells me that this one will develop for at least 15 years, stabilize for a decade or so, and then begin a slow decline. I'm sure it'll still be wonderful in 20-30 years, but it's peak will likely be quite a bit earlier, like most full bodied English/Balkan mixtures. Still, I'm cellaring it in enough quantity to prove myself wrong in my own tenth decade. All Content Copyright © 2018 - G. L. Pease. All Rights Reserved. Use of images or text without express permission is prohibited.